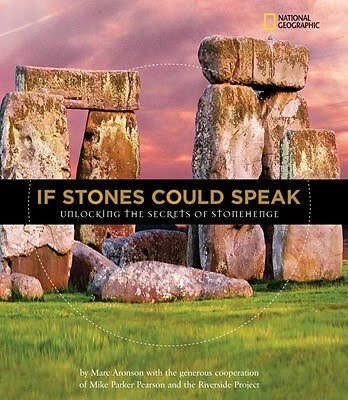 If Stones Could Speak: Unlocking the Secrets of Stonehenge by Marc Aronson. Grades 4-6. National Geographic, March 2010. Review copy provided by my local library. 64 pages. Stonehenge is a mystery. There have been many theories about what this circle of stones could have meant to the people that built it. If Stones Could Speak is about the continuing quest for an explanation. All his life, Mike Parker Pearson wanted to be an archaeologist and study Stonehenge, but he'd thought all the research had been done. So Mark moved on and studied other parts of the world... until the BBC contacted him about bringing someone from Madagascar (where Mike was working at the time) to Stonehenge for a fresh opinion. When Ramilisonina, a retired archaeologist from Madagascar, looked at the stones, he saw them in a new way, differently than all the archaeologists that had come before him. So Mike assembled a crew and they began to excavate some areas around Stonehenge. Lo and behold, they found a bunch of fascinating things that indicate that Stonehenge might have been part of a larger community living space. Mr. Aronson gave an in-depth look into the process of studying history with his book Ain't Nothing But a Man and here he does it again. Not only does he follow archaeologist Mike Parker Pearson and his crew and document their work studying Stonehenge, but he encourages kids to think outside the box, to look at things with fresh eyes. New technology is being developed all the time and these new technologies can help us study the past in ways we'd never imagined. 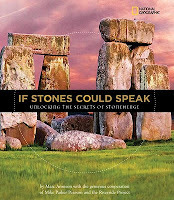 The book includes a wonderful resource list (including recommended reading for kids and for adults), a glossary/encyclopedia of Stonehenge terms, and many time lines about the study of Stonehenge and the current theories and date information. It's a great work of nonfiction for kids and will appeal to budding historians. Stonehenge is an appealing topic and that'll get kids picking it up off the shelf. I'd also hand it to kids interested in archaeology and particularly fans of Written in Bone by Sally M. Walker and Lucy Long Ago by Catherine Thimmesh. Read more reviews at Lori Calabrese's Blog, Shelf-Employed, and Bookends. If Stones Could Speak is on shelves now! And Happy Nonfiction Monday! Go check out this week's roundup at Books Together.